With the Easter holidays behind us, there’s a good chance your auxiliary battery needs some maintenance. Permanent damage might even be happening to your battery as you read this! But don’t fret, there’s still time to save your battery and prolong its life. A lot can be said about battery life and how it relates to recharge rates. In the interest of simplicity, here’s the gist of it: A deeply discharged battery must be given enough time to recuperate. There’s a popular misconception that a battery can rapidly recharge in a short space of time. This is simply not true for most batteries. Unfortunately, very few battery manufacturers and fitment shops convey this message, and overland travelers are paying the price. Using a popular 105 Ah (wet cell) deep-cycle battery as an example, the graphs highlight a few lessons about dual-battery ownership. This graph shows how much usable energy can be drawn from a 105 Ah deep-cycle battery. The highlighted area depicts the safe operating zone and equates to a 70 % depth of discharge. In other words: You don’t get 105 Ah from a 105 Ah battery! Generally, you can draw between 70 and 75 Ah of usable energy from the abovementioned battery before entering the deep discharge area – where battery damage is accelerated and the life of the battery is shortened. What’s the moral of the story? Leaving a battery in a discharged state will accelerate degradation and cause permanent damage. There are so many variables at play when it comes to a dual-battery system, but generally the following rings true: Most dual-battery users are unaware that their auxiliary battery is partially discharged, and because of this, the performance and lifespan of their battery is compromised, resulting in frequent battery replacement – or the inability to power a camping fridge through the night. Of course, the simple solution to this problem is to drive more, but for most holidaymakers, driving four to eight hours to recharge a battery is simply not practical. Plus, there’s a good chance your auxiliary battery won’t recharge fully, especially if it was deeply discharged the night before. It’s an exponential problem: Each day the battery is not fully recharged, there’s an increased risk of taking it into a deeply discharged state, which is difficult to recover from. Thankfully, the solution is simple. 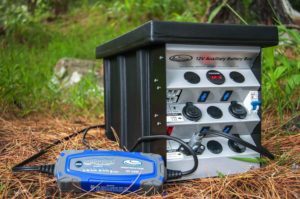 If you own an auxiliary battery, you need a 220 V maintenance charger to restore full capacity and ensure that the battery is kept at optimum health, ready for your next adventure. National Luna’s Intelligent Maintenance Charger ensures that your battery gets what it needs in terms of time and energy to reach a fully recharged state. With years of battery-charging and maintenance experience, National Luna’s onsite laboratory conducted a series of tests on almost every battery charger on the market. The results culminated in the launch of an affordable battery charger that does exactly what a battery needs. The eight-step recharge program includes a diagnosis of the battery’s health followed by an automated sequence of recharge rates to recover, restore and enhance battery life. Best of all, the charger is self-regulated, so it can be connected to your battery for an indefinite period of time without the risk of damaging the battery or “overcharging” it. The Intelligent Charger is suitable for wet, AGM, GEL and calcium batteries from 1.2 Ah to over 120 Ah. The reduced power mode is ideal for small batteries used in motorbikes or jet-skis, while “boost” mode is useful for periodic maintenance of calcium batteries or batteries that have been severely discharged and are showing signs of reduced capacity. The National Luna charger also features two cable options, allowing you to choose how to connect the unit to your battery. National Luna is a 30-year-old South African company that produces the world’s widest selection of commercially available 12 V fridge/freezers. They’re also the preferred supplier to most major off-road trailer and caravan manufacturers, and a global distributor of more than 200 outdoor products and accessories. The National Luna Intelligent Maintenance Charger has a five-year guarantee and sells for R1 595 at all leading outdoor and 4×4 stores. A non-regulated 220 V trickle charger can often cause more damage than good. It doesn’t account for mains power surges and might expose the battery to excessively high voltages and subsequent gassing. The National Luna Intelligent Maintenance Charger, however, regulates the input and desired output voltage for optimum battery health.